1929 is a rather infamous year in American history. It was the year that the first science fiction comic strip was introduced; Babe Ruth became the first major league baseball player to hit 500 home runs; and the first Academy Awards ceremony was held in Hollywood. But you'll be forgiven if you only remember 1929 as the year that kicked off the Great Depression. The "Roaring Twenties," was a decade of tremendous technological, cultural and economic growth. Incredible advancements were made in radio, movies and cars — all of which would make the country feel that much smaller and more connected. The 19th Amendment was ratified, finally giving women the right to vote. And the stock market was heading up — way up. The market was performing unbelievably throughout the decade: up 20 percent in 1927, and almost 50 percent in 1928. Most people thought that (minor blips aside) the stock market would just keep climbing. But everything ground to a halt on October 24,1929. The bubble burst on that day and though things would level off a bit on Friday, the market again went into free fall when it opened on Monday, October 28. The next day would become known as Black Tuesday when the market lost 11 percent of its value immediately upon opening. The rest is Great Depression history. It's curious then to note an article in the December 30, 1928 issue of the Ogden Standard-Examiner from Ogden, Utah which foresaw a different vision for 1929. 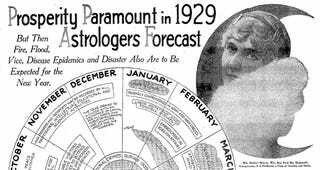 With the headline "Prosperity Paramount in 1929 Astrologers Forecast" the newspaper printed the predictions of astrologers from the year 1928 who insist that, though 1929 might start out a bit rocky — continuing the normal run of disasters, fears and everyday awfulness which have plagued humanity since the dawn of time, I suppose — it will be remembered as a year of prosperity for all. The article is filled with generalizations and platitudes; but when plain, direct language is used about the course that 1929 will surely take, the predictions could not be more wrong. In fact, the predictions for October through December, 1929 are darkly amusing for just how tragically optimistic they were. Wages and expenditures were predicted to rise to new record heights, and no less than world peace was anticipated by the end of 1929. The astrologers also predict that, "High progress and prosperity may be recorded by all, professional, intellectual, educational and scientific activities." With the benefit of hindsight, the final prediction for December of 1929 may be the most macabre: "The year draws to a close with an abundance of capital for all needs and public developments, and unlimited credit for the worker." Prognostication is a tricky mix of art, science and luck. But it appears that the stars just didn't align for these fallacious soothsayers.